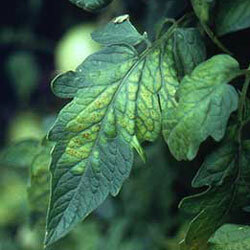 Tomato chlorosis virus can cause significant losses to tomato harvests, but generally its effects are minor. 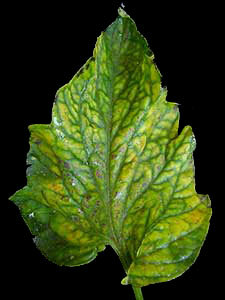 Generally starting with older leaves, the virus causes stunting and rolling, with red or yellow coloration between the veins; new growth continues to appear normal. As the disease progresses, the leaves become brittle, thick, and crisp. Yellow or red coloration between the veins of older leaves. Older leaves become brittle, thick, turn yellow. Presence of greenhouse whiteflies, tiny yellowish insects with white wings. Besides tomatoes, also affects pepper plants and some weeds. Avoid planting near other susceptible plants such as artichoke, lettuce, potato, zinnia, and petunia. Natural enemies of whiteflies will normally keep them under biological control, unless overuse of insecticides has eliminated natural predators. Control of heavy whitefly infestations is very difficult, as they are not well eliminated with any available insecticides. Insecticidal soaps and neem oil can reduce but not totally eliminate whiteflies.